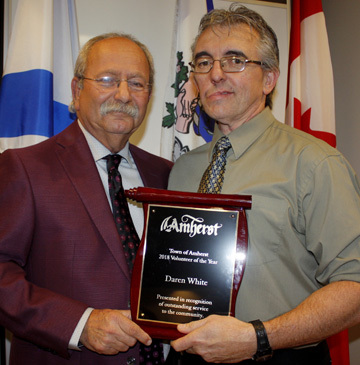 Well-known teacher Daren White has been named Amherst’s 2018 Volunteer of the Year. “Daren White is no ordinary human being,” Mayor David Kogon said Feb. 26 as he announced White’s selection. “By day, he’s one of those very special teachers who are admired by his peers and thousands of children for his creativity and enthusiasm. “His volunteering superpowers include organizing sports for kids, building and painting sets for school plays, teaching kids how to play guitar, building outdoor skating rinks and finding creative ways to raise thousands of dollars for charities. As an example of his volunteer efforts, his nominators pointed out that White has brought a record number of volunteers to the Relay for Life and his team has raised more than $125,000 for the Canadian Cancer Society. In addition, he’s organized the Terry Fox Run with his classes since 1988, personally fundraises for individual families suffering from disease and hardship, and donates artwork to auctions that support health and arts and culture organizations. In addition, he annually volunteers for the P.E.I. Boys and Girls Club celebrity golf tournament, established the Kelly/Ruth Nichols Scholarship Fund and worked with another teacher to raise money for a school in Uganda that had only one soccer ball. They have sent the school balls, volleyball nets, basketball rims and this year hope to raise enough money to buy desks for an entire class. 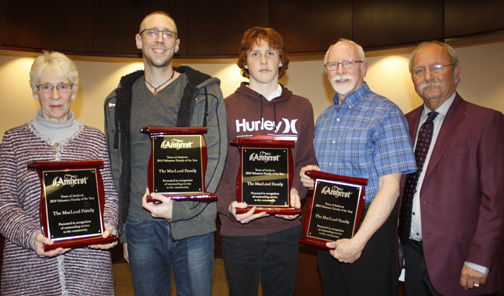 Kogon also announced the MacLeod family – Lawry, Mary, Ben and Owen – has been selected as the town’s 2018 Family Volunteers for their decades-old volunteer effort to bring culture to the area through Showcase Productions, one of the few organization providing community theatre, youth drama camps and shows for adults. Besides being involved in Showcase Production, the mayor indicated the family also volunteered for many community organizations and at their church. 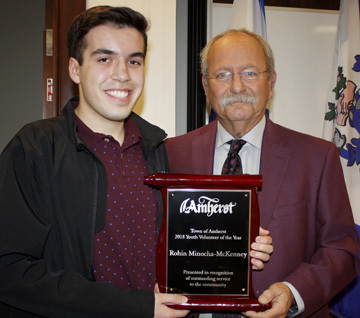 Rohin Minocha-McKenney, a student at Amherst Regional High School and junior mayor on the Amherst youth town council, was introduced by Kogon as the town’s 2018 Youth Volunteer. “Rohin is interested in helping others and provides service in a consistently positive and helpful manner,” Kogon said. “He is self-assured and can calmly handle the stress associated with a busy volunteer schedule. He successfully balances academics, sports and family life with a strong sense of stewardship and community-mindedness. Besides volunteering with the Amherst youth town council, Rohin has volunteered as a peer counsellor, at school dances and the Valentines Run. He is an ARHS student council member, has volunteered at basketball tournaments and on Canada Day. He is also a volunteer with the ARHS EBC Band and Choir Association, the Hindu Temple, Cumberland Pride and more. The recipients will represent Amherst at the Nova Scotia Volunteer Awards reception in Halifax on April 12. The town will recognize these volunteers and a host of others during a ceremony on April 18. Nominations for these awards will be accepted until March 19.